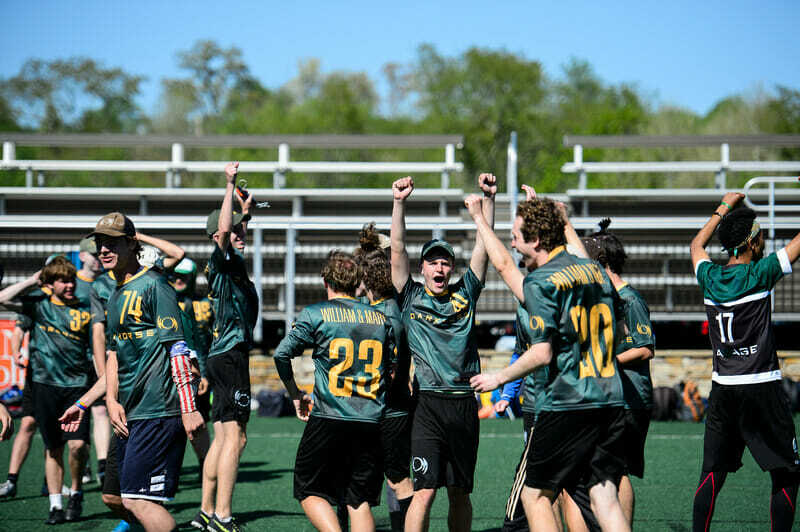 College Update during the 2019 season is presented by Spin Ultimate. Please support the brands that make Ultiworld possible and shop at Spin Ultimate! Both California and UC Davis, the no. 1 and no. 2 seeds, respectively, carved through the competition– and thorough precipitation Saturday –at the Presidents’ Day Qualifier. Both teams came into the final undefeated; Cal had allowed just 11 goals against them in their five previous games, while Davis won all of their matches by five or more. And the final was fittingly competitive: Davis took control heading into the half with a narrow 7-5 lead. But a late 4-1 run from the Pie Queens sealed it, with the high seed earning the 9-8 win. They’ll join the field at the upcoming Invitational. After a rocky start in the form of an 8-7 win over Alabama, no. 1 seed Clemson tore through Royal Crown Classic on their way to a dominant tournament title. They gave up just three points in their two bracket play games, living up to their reputation. No. 2 George Washington and no. 3 Catholic went toe to toe twice at Hucking & Shucking, splitting their results. But it was Catholic who got the win that mattered most: they won the final 12-10 after round robin pool play concluded. It was a strong weekend for #12 Catholic, who took home the crown at Hucking & Shucking. They did drop a game against George Washington in round robin pool play, but took the 12-10 win in the final. That improvement from at 13-6 loss on Saturday is remarkable, and indicative of Catholic’s resolve. A 6-1 weekend is a great start to the season. No 2. seed UC Santa Cruz fought through a crowded and mostly Californian cast of opponents to win the Presidents’ Day Qualifier. The top seed, Arizona State, was eliminated in the semifinals by Chico State. However, with a short bench, Chico State couldn’t run with Santa Cruz down the stretch. After a close first half, UCSC pulled away with a 4-2 run to win 11-8. They’ll add another tournament to their schedule after getting the late call from the Santa Barbara Invite this January, where they went 2-4. The Prez Day field will make it tough for them as they try to improve on that record. Vermont opened their season in spectacular fashion by notching seven straight wins to take home the crown at Mid-Atlantic Warmup. Their most competitive game was the final against no. 1 seed William & Mary, a 15-14 victory. Chill carried a 14-11 lead late before W&M climbed back into the game to force double game point. Mississippi State ran the table at Royal Crown Classic, edging out Troy 13-12 in the semifinals before overtaking Georgia Southern in the final. The no. 1 seed, they beat Southern twice on the weekend. You know it’s a wild weekend when the semifinal teams are the no. 2, no. 7, no. 10, and no. 11 seeds at the tournament. John Brown upset the top seed, Texas State, in quarterfinals and eliminated Oklahoma State in the semifinals. But Texas Tech took home the Big D in Little d title with an emphatic 15-4 win in the final. While D-I men’s play had a relatively quiet weekend ahead of big tournaments like Florida Warm Up and Queen City Tune Up, it was another busy week in the D-III men’s division, with six teams Top 25 teams in action, including a few important games between the Atlantic Coast and New England regions. The #8 Richmond Spidermonkeys had the strongest weekend at Mid-Atlantic Warm Up, finishing fourth with a 5-2 record and suffering their only losses in the semifinal and third-place games. Playing on the tail end of back-to-back tournament weekends, the Spidermonkeys built on the lumps they took last weekend at Carolina Kickoff and saw success while continuing to use their impressive depth. #20 Davidson DUFF had a strong start to their season, finishing in sixth with a 4-3 record. DUFF’s weekend was highlighted by two big wins over #11 Williams WUFO, the first coming on a double game point break in pool play after a furious comeback. While Davidson’s lack of height left them exposed against some of the D-I opposition, they were able to rely on their speed and defense on unders to frustrate teams into turnovers all weekend. #11 Williams and #3 Mary Washington Mother of George will feel like they missed opportunities for big wins on the table. On the surface, Williams’ weekend looks promising, beating every D-I team they faced. However, their two losses to Davidson and loss to Richmond after leading late in the game of all three matchups are going to leave a bitter taste in WUFO’s mouth and could have significant impact on bids at the end of the season. Despite missing three starters all weekend and star Joe Richards for the second half of Saturday, Mary Washington was still in a position to have a solid weekend. However, up 10-8 in the crossover against Tennessee-Chattanooga, MoG collapsed and lost 12-10, leaving them to play uninspired consolation games the next day. While the East Coast teams battled it out in Virginia, the South Central got their season underway at Big D in Little d down in Denton, TX. #12 John Brown Ironfist got their season started with an impressive 6-2 record highlighted by wins over Oklahoma and Texas State. In classic Ironfist fashion, John Brown battled through the weekend with just 12 players. Led by Spencer Patterson and Garrit Headley, Ironfist proved deserving of their high preseason ranking and laid the foundation for another bid-earning season. Two unranked South Central teams staked claims for Top 25 status with impressive play in Denton. Rice Cloud 9 arguably had a more impressive weekend than John Brown, matching their 6-2 record and only losing to eventual champions Texas Tech. Cloud 9 has been on the doorstep of Nationals for years; could this be the year they finally break through? Colorado College Wasabi had an up-and-down weekend, finishing with a +51 point differential in their five wins but a -13 in their two losses. Wasabi is clearly talented, and if they can harness that talent into a more consistent system over the course of the season, they’ll be capable of shaking things up at Regionals. This weekend down in Tampa will definitely cause a shake up in the Power Rankings. #2 Carleton, #4 Brown, #5 Pittsburgh, #6 Wisconsin, #8 Minnesota, #9 BYU, and a host of other ranked squads, are all participating in Florida Warm Up (M), the first major of the season. Buckle up because it is going to be an exciting weekend that could have you glued to Twitter. #1 North Carolina, #7 UMass, #10 NC State, #22 Auburn, #23 UNC Wilmington, and #25 Ohio State are all going to Queen City Tune Up (M/W) on the men’s side this weekend. The women’s division hosts #3 North Carolina, #4 Carleton, and #5 Ohio State, among a solid field. This event has the potential for good teams to prove their dominance or to cause some major shake ups. Stanford Open (M/W) offers a chance to reach the elite Invite event next month. In the women’s bracket, #19 Cal Poly SLO and D-III notables #3 Puget Sound, #20 Air Force, and #24 Lewis and Clark highlight pool play action. The men’s division will host Oregon State, California, and UCLA in a huge field of 40 teams, though a curious inclusion is no. 8 seed Stanford. The back half of the 40 does include B teams as well as some local high school teams, but that many teams could breed unpredictability. Comments on "College Update: Presidents’ Day Qualifier, Mid-Atlantic Warmup"